Over the past month we've been on a big organization/new routine/get caught up push. I'm organizing all the paper, I'm getting the house and the car back on track, I'm getting into a good routine for myself. I won't say that I'm loving the process, or that I've gone full on KonMari or anything, but I am loving the results. I love walking into the master bedroom and not seeing piles of clutter. I love knowing that our school things are organized. It's been a good month, and man, does it feel good to say that. The latest thing is really getting the girls on board with our good routine and clutter-lite life (I'm not so bold as to say we're clutter free). They used to have a decent routine of cleaning up their toys, but then our schedule got crazy, and just when we got a handle on that, life got crazy and Adam and I totally dropped the ball with any reinforcement. So...yeah. The girls followed our lead and got very lazy about cleaning up their toys. I can't even really blame them for it. I was slacking, Adam was slacking, and with that kind of example, it's a wonder they didn't go completely feral. But once the grown ups woke up and got our acts together, we knew there was some retraining that had to take place. There were plenty of new Christmas toys fighting for space with the old toys, and most nights we were turning in with the old toys still all over the rug. We spent a lot of time searching for water bottles that were scattered throughout the house, and had some frustrating moments of realizing that the charge on the iPad was completely depleted because it hadn't found its way back to the charger. Reagan's room was semi-cluttered and messy, but Madison's was starting to look like a full day project. These were clearly responsibilities of the children, but they had to be (re)trained. 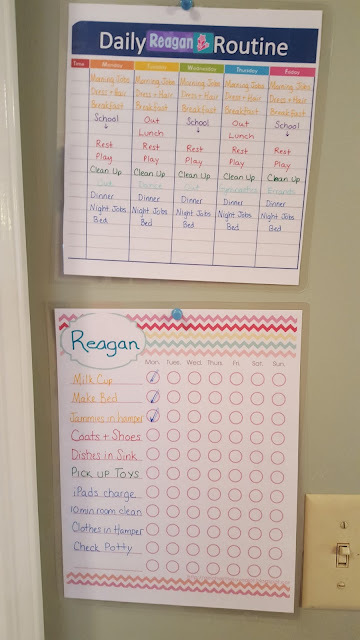 Back in the beginning of the year, we needed to start an incentive program to encourage Reagan to behave outside of the house. Reagan is an awesome, smart, spirited and stubborn kid, and, although she professed to love all her outside activities, I wasn't getting the best reports. We heard she was digging her heels in at school when asked to do things that she didn't want to do, and she was opting to sit against the wall for the majority of dance. Not because she didn't like it, but because she could. got a good report from preschool. That's it. And judging by the fact that she was instantly able to do all these things without a bit of protest told me that this really was a stubborn thing. was responsible for her dance bag, water bottle, tennis gear, etc. remembered to practice her solo. Madison too was able to adjust instantly and got a surprise every Friday. So on we trooped, through September, October, November, December, giving a treat every Friday for basically no effort. The behavior chart equivalent of a participation trophy. Obviously, if we wanted to actually make these Friday boxes worth something, we needed to change something. We kept the boxes, but told the girls that we were starting new responsibility charts. We started easy - the bare minimum they were expected to do every day. Some things were no brainers - hang up your coat, put your dishes in the sink, put your clothes in the hamper. Some were expected, but easy to "forget" - pick up the toys, put the iPad on the charger. And some were new - ten minutes of tidying bedrooms, making their own beds daily, doing daily household chores like sweeping the kitchen floor and wiping down counters. Finally, we look at the overall day and decide if it was a "good day". If they get more check marks than Xes over the course of the week, they get their reward. That's it. A bad day won't destroy you, and the little things add up. Since we started this, we no longer have to hunt down water bottles. We aren't tripping over coats and shoes. Beds are made daily, and ten minutes of room clean up a night has taken potentially overwhelming messes to rooms that are easily maintained. 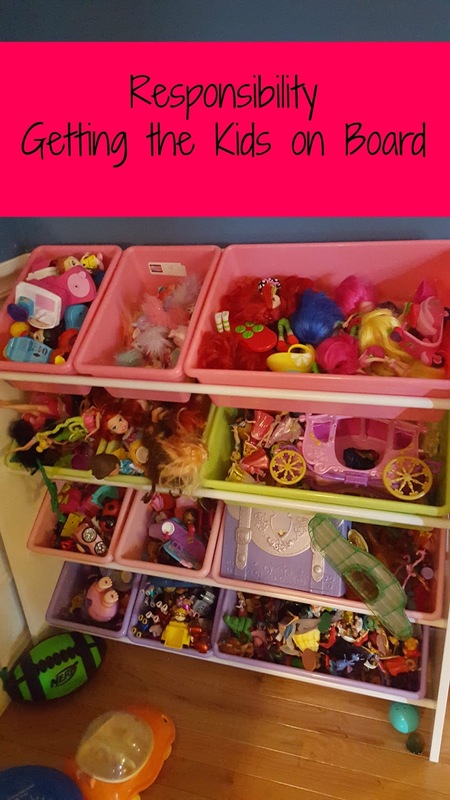 The toys are organized again, so cleaning up daily isn't an issue. We talked the girls before we started this about how everyone in our family needed to reboot and get back on board with working together to keep our house a nice place to live. The girls see their parents making their bed daily and cleaning up their rooms, and they understand that they need to do their part. They are starting to feel satisfaction in going to bed with a day full of check marks, and they're being careful not to make any huge messes that will be difficult to clean before bed. Fewer toys out means an easier job later, and they like that. Now that Madison is really into Legos (which happened after Christmas, naturally), we're talking about taking advantage of something like Pley. I love the idea of getting a new set to build, but sending it back before you get the next, and I think Madison is starting to get on board. Pley really encourages kids to kick the clutter habit before it gets out of control, and that's never a bad idea. As the girls get older, the systems we put in place will grow with them. They'll share more responsibilities and the way we use incentives will obviously change too. But right now, baby steps have made a big difference, and I'll take it.